Having out-of-town guests is a treat, especially when the guest is an old friend that you haven't seen in a decade and, sadly, probably won't see again for another. Jaime and her husband Bert recently came to visit, bearing such Canadian bounty as Map-O-Spread (creamy, spreadable maple-y goodness) and eleven pounds of Five Roses Specialty Whole Wheat Flour*--do I have good friends or what? In preparation of Jaime and Bert's arrival, I dug up information on where to take them and was rewarded with the discovery of all sorts of places that, after all these years, I've yet to visit (A parasite museum? Hello, where *have* I been?). I also learned of an old trend in Tokyo, which I had no idea was so extensive: theme restaurants. After receiving confirmation that this was just the sort of thing they wanted to experience, I found myself making an online reservation for Ninja Akasaka. I'm going to be a party pooper here and admit that I am neither a fan of ninjas nor theme restaurants. However, caught up in my guests' enthusiasm, and reassured by all the positive reviews online, I found myself not dreading the upcoming meal. Really, you just have to be in the right state of mind. Which is probably why we were all thoroughly disappointed by Ninja Akasaka. We came with full expectations of overblown cheese; instead--except for the baffling lava-tube-like interior and neon-lit pools of water--what we got was an overpriced restaurant, battling against self-inflicted odds to be classy while rushing diners through their two-hour time slot. Our walk to the table was probably the high point of the evening. We were waiting at the entrance when a "ninja" burst through a sliding door in front of us with a hearty shout. I think we were meant to be surprised and impressed by his swiftness with sliding doors. 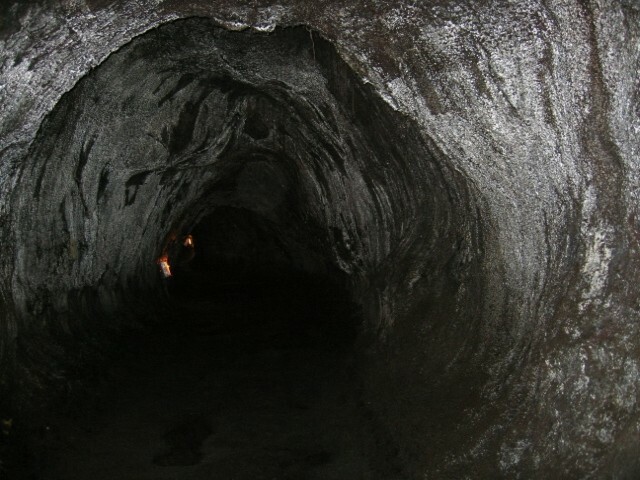 We were then led through the sliding door and into the lava tube--I mean, ninja's lair. The lava lair was narrow, windy, nearly pitch-black, and low enough that the threat of a concussion was quite real. In fact, right after I bumped my head, our ninja courteously warned me to watch that I didn't bump my head. At one point, we came to a large piece of plexiglass and our ninja demonstrated his masterful ability with a remote control, causing a drawbridge to lower and allowing us to traverse the otherwise perilous plexiglass. Eventually, the tunnel opened up into a cavern and we reached our black little cubbyhole, where a petite, chirpy young lady promptly greeted us. I guess I was expecting a menacing waiter in dark costume, looking more likely to bring us a quick death than a cocktail, perhaps taking our order while hanging upside down, and at least slicing up our veggies with a deadly spray of shuriken. Maybe we expected too much, but because our waitress was dressed the part, we kept waiting for her to... do something. Well, she did this one trick where she disappeared into the cavernous darkness for about 15 minutes after handing over the drink menu, but then she came back. She then whipped open a black scroll--our menu--with a little chirrup and promptly disappeared again. Okay, I'm totally getting long-winded, so let's pick up the pace. The menu (available in Japanese and questionable English): there were about eight set menus, ranging from 70,000 to 150,000 and also a la carte items. I want to say the food is fusion, but really it seems like the menu planner just went plain mad: foie gras, Cesar salad, sushi, foie gras, sweet and sour pork, Vietnamese pho, foie gras, steak, and also some foie gras. I'm sure we would have enjoyed ourselves a bit more, had we ordered the set course, but it was more than we were willing to spend at a theme restaurant, where we had come for the entertainment, not the food. Perhaps we were paying for the overall "experience," but at a restaurant that seems targeted at children and tourists, the menu was a little overzealous about things like foie gras and wine going for as much as 100,000 yen. The food came and went. Everyone admitted it was good, but the portions were inadequate, to say the least. For 2,800 yen, I received a little eggplant and five paper-thin coins of duck breast. Words like "Saw a McDonald's near the station" were bandied about. Still, nothing ninja-ish had happened, and we were starting to wonder if we were being punished for not ordering enough. Then, finally, a man appeared at our table. We all sat up, riveted, faces expectant. He did some magic tricks with coins, cards, and rubber bands, we clapped a little too enthusiastically, and then he left. Our chirpy waitress reminded us our two hours were almost up. I asked for tea to stall for time. We heard delighted gasps from other tables in dark, far off corners. I thought I saw a small burst of flame. The tea arrived. We sipped slowly, willing another ninja to come to our table. Ms. Chirpy begged us to pay the bill. We did. We were gently ninja-d out of our booth and toward a side door, which brought us back to the entrance of the restaurant. We emerged onto the street to see another party drunkenly posing for pictures, obviously having just had the time of their lives. Our waitress, who had followed us out, happily yanked open a "Please come again" scroll, which was kind of cute. So there you have it. I have read outright rave reviews of Ninja Akasaka, so I suppose we were merely unlucky that we were ignored by the roaming ninjas and their tricks. I also think certain dishes come with a bit of song and dance, so if you do go, I'd ask your waiter to recommend things. But for me, Ninja Akasaka is too much of a pricey gamble, when you're expected to go there and simply hope something fun will happen. After all, who enters a theme restaurant praying for subtlety? I want the gimmicks and tackiness to club me over the head, preferably with a staff like Master Splinter's**. Directions: Take the Sotobori Exit and go up the escalator. Turn left, cross the street toward Tokyu Plaza, turn left, walk until you're almost at the end of the plaza, and you'll see the restaurant logo and a doorway. *My friends aren't lunatics. It's truly quite hard to find whole wheat flour in Japan. What they have in the stores are these dinky five-gram bags of flour for 500 yen, of which I'd have to buy about 30 in order to make a little loaf of bread. **Who's Master Splinter? Sage old rat? Teenage Mutant Ninja Turtles? If you still don't know what I'm talking about, never mind, it's not worth Googling, I assure you. Okay, you can both stop chortling and gagging already. Whoah, whoah, whoa, Hsin-Li--Ms. Likes Disneyland! I don't think you get to be horrified! Plus, I thought I defended myself and stated clearly that I am not a theme restaurant girl, I was merely being a good, accomodating host. Sniff. Hey, Hsin...gag yourself...if you're so frightened, it has nothing to do with the restaurant or the theme, get a life!!! the ninja was fun though pricey, and the black sweet and sour pork was excellent. Don't expect Disneyland, and you'll be happy with this funny place.